In this column, Ignacio Ramonet, director of the Spanish language edition of Le Monde Diplomatique, writes about the last time he saw Colombian Nobel Literature laureate Gabriel García Márquez, who passed away on Apr. 17. The next morning, in the humid heat, I climbed a palm tree-lined drive and knocked on the door of the tropical villa. I knew he was suffering from lymphatic cancer and that he was undergoing exhausting chemotherapy. They said his health was delicate, and there was even talk of a heart-wrenching “farewell letter” to his friends and to life…I was afraid I would encounter a dying man. A little while later, sitting on a white sofa in the dim living room, I watched him come in, certainly looking fit, with his curly hair still wet from the shower, and his thick moustache. He was wearing a yellow guayabera shirt, wide white pants and canvas shoes. A character right out of a Visconti film. A stiff breeze lifted the curtains on the huge windows up high and the living room started to feel like a flying ship. I told him how much I liked the first volume of his autobiography, ’Living to Tell the Tale’. “It’s your best novel,” I said. In the background the notes of Antonin Dvorak’s New World Symphony flooded the room, creating an atmosphere at once joyous and dramatic. 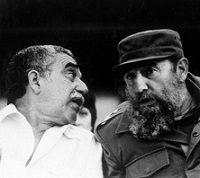 I had met Gabriel García Márquez some 40 years earlier, in 1979, in Paris, with my friend Ramón Chao. Gabo, as he was affectionately known, had been invited by UNESCO, and along with Hubert Beuve-Méry, the founder of Le Monde Diplomatique, formed part of a panel chaired by Nobel Peace Prize-winner Sean MacBride, which was charged with producing a report on the north-south imbalance in the global media. Back then, he had stopped writing novels, as part of a self-imposed ban that was supposed to last as long as General Augusto Pinochet (1973-1990) was in power in Chile. He had not yet received the Nobel Literature Prize, but he was already immensely famous. The success of One Hundred Years of Solitude (1967) had made him the most widely read Spanish-language author since Cervantes. I remember being surprised at his short stature and struck by his gravity and his serious demeanor. He lived like a recluse, only leaving his room, which had become a kind of cell where he did his work, only to go to UNESCO. With respect to journalism, his other great passion, he had just published an account of the seizure by a Sandinista commando of the National Palace in Managua, Nicaragua, which had triggered the downfall of dictator Anastasio Somoza. He furnished a wealth of details that gave the impression that he himself took part in the event. I wanted to know how he had managed to do that. He told me: “I was in Bogotá at the time of the assault. I called General Omar Torrijos, the president of Panama. The commando had just been given refuge in his country and still hadn’t talked to the media. I asked him to tell the guys to be wary of the press, because their words could be distorted. He responded: ‘Come. They’ll only talk to you.” I went and the leaders of the commando – Edén Pastora, Dora María and Hugo Torres – and I shut ourselves in a room in an army garrison. However, I remember that once I laughed till I cried. I was coming back from Cartagena de Indias, a sumptuous colonial city in Colombia; I had glimpsed his house behind its high walls, and I mentioned it to him. He asked me: “You know how I got that house?” No idea. “Since I was very young, I wanted to live in Cartagena,” he said. “And when I had money, I started looking for a house there. But it was always too expensive. A lawyer friend explained to me: ‘They think you’re a millionaire and they jack up the price. Let me look for one for you.’ A few months later, he finds this house, which at the time was an old print shop, nearly in ruins. He talks to the owner, who was blind, and they agree on a price. “But the old man sets a condition: he wants to meet the buyer. My friend comes and tells me: ‘We have to go see him, but you mustn’t talk. Otherwise, as soon as he recognises your voice, he’ll triple the price…He’s blind, you’ll be mute.’ The day of the meeting arrives. The blind guy starts asking me questions. I answer in indecipherable grunts….But at one point, I make the mistake of saying ‘yes’ loud and clear. ‘Ah!’ says the old man, ‘I know that voice! You’re Gabriel García Márquez!’ He had figured out who I was. Outside, torrential rain was pouring down from the sky with the force of a tropical storm. The music had gone silent. A heavy fragrance of orchids invaded the room. I glanced over at Gabo. He had the tired look of an old Colombian leopard. He was sitting there, silent and meditative, staring at the endless rain, the constant companion through all his solitudes. I slipped out quietly. Without knowing I was seeing him for the last time.